This webpage reproduces a similar page on the former Network Myanmar website. The former page also has links to events in Arakan during the years 2012, 2013, 2014, 2015 and 2016. Dr. Maung Zarni campaigns internationally on behalf of the Rohingya. His website at this link contains a record of his presentations and interventions. 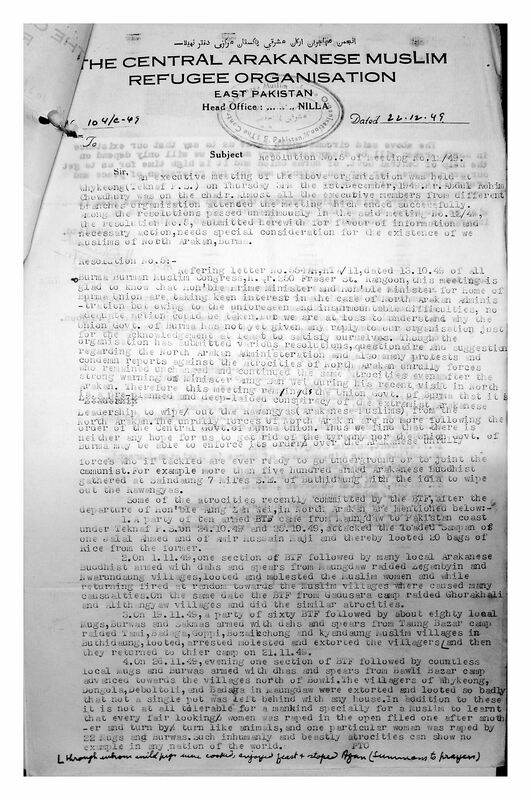 Maung Zarni's collection of documents with early references to "Rohingya"
In 1939 the Governor of Burma appointed a Commission of Inquiry to examine the question of Indian immigration into Burma. It was prompted by communal disturbances during the previous year due to “the existence of a serious misapprehension in the minds of many Burmans that Indian immigration was largely responsible for unemployment or under-employment among the indigenous population of Burma” (Joint Indo-Burmese Statement - See Page 8 of Part B). The Commission was headed by James Baxter, Financial Secretary, Tin Tut, Barrister-at-Law and the first Burmese member of the prestigious Indian Civil Service, and Ratilal Desai MA. We attach a full copy of the Report of the Commission completed in October 1940 and published in Rangoon in 1941 by the Government Printing and Stationery Office. The Report made recommendations which were generally accepted by the Governments of Burma and India as a basis for negotiation and were finalised in an Agreement between the two Governments - See Page 9 of Part B). The Agreement provided that the existing Immigration Order of 1937 would continue at least until 1 October 1945, while Indian immigration into Burma would be subject to the new rules contained in the Agreement with effect from 1 October 1941. On 8 December 1941 the UK declared war on Japan, and the rapid invasion of Burma by Japanese forces meant that the Agreement never came into effect. The Report is available in at least 20 Libraries around the World including the UK, US, Singapore, Australia, New Zealand, Switzerland and Myanmar. Nowhere in the Report, nor in the scores of papers associated with the Report in the National Archives and the British Library in the UK, does the designation “Rohingya” appear in any shape or form. 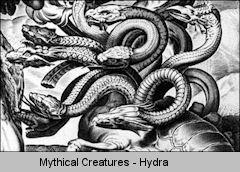 From 1824 to 1948, the term was not used by, and would seem to have been unknown to the British administrations of either India or Burma. “There was an Arakanese Muslim community settled so long in Akyab (Sittwe) District that it had for all intents and purposes to be regarded as an indigenous race.” (Paragraph 7). This theme of the “indigenous” nature of Muslims permanently resident in Arakan is repeated in the Report and provision is made in Article 19 of the Agreement for Indians (whatever their religion) born in Burma to acquire domicile. Prior to 1947, nationality was not an issue as residents of both Burma and British India enjoyed the status of "British Subjects" and the concept of "citizenship" had not yet come into effect. Paragraph 67 of Chapter VII on Arakan highlights the concerns of Arakanese who “maintained that Chittagonian penetration is steadily continuing and is resented not only by the Arakanese proper but also by the settled Chittagonians......The view was expressed that it was inadvisable to let Chittagonian immigration go unchecked as it contained the seed of future communal troubles. 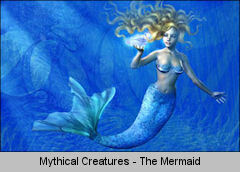 All the witnesses agreed that immigration from Chittagong should be restricted”. On Mahatma Gandhi's criticism of the 1941 Agreement, see his Statement to the Press dated 24 August 1941 on pages 14-18 of this link. Might a UN 'Committee of Wise Men' point the way towards an eventual resolution? A critical appreciation of the forthcoming Conference in Oslo on the Rohingya. See also the cable of 14 June 1978 from the US Embassy in Rangoon, notably paragraphs 6, 7 and 8. In a despatch to London in May 1957, Ambassador Richard Allen reported that during a recent session of the Burmese Parliament, a redoutable Member of Parliament, U Kyaw Min, barrister and former member of the Indian Civil Service, had presented in strong terms during a speech made on the 15th March 1957 the grievances and aspirations of Rakhine politicians and the local population. He noted in his despatch: "The intemperance of U Kyaw Min's speech caused an uproar and the Speaker directed that it should not be published". However, the Ambassador obtained a copy and the speech soon became public knowledge. It is worthy of particular note that U Kyaw Min did not refer to the Muslim community in Arakan during his speech, which was directed rather against the central governement of U Nu and his Anti Fascist People's Freedom League (AFPFL), both seen as the source of all Rakhine tribulations. 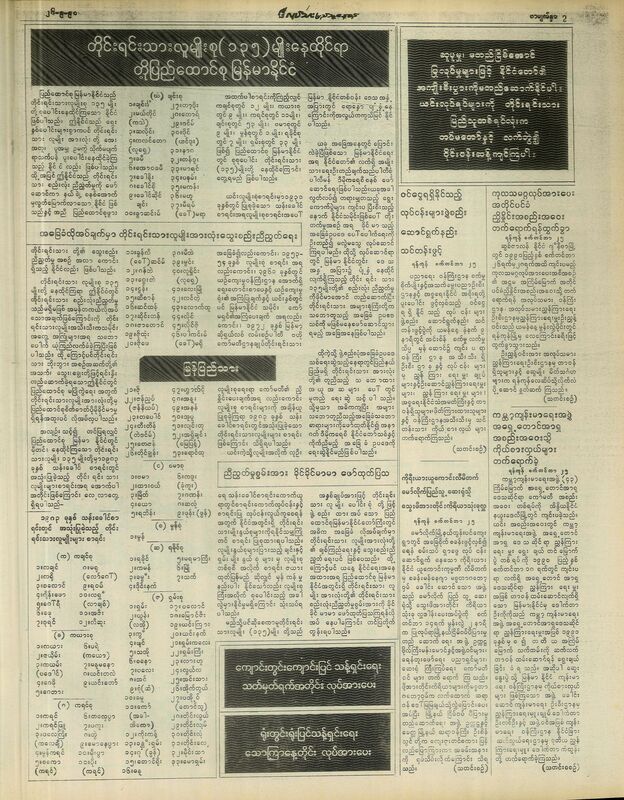 Later in 1957, U Kyaw Min was able to publish a paper in amplification of his speech. 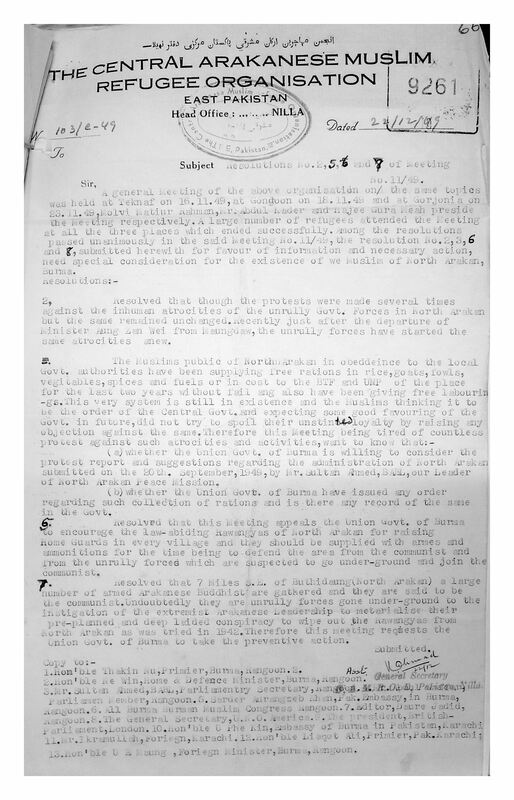 This paper reproduced the essence of his remarks, adding one short paragraph only about the "Chittagonian problem", saying that this was not serious as Chittagonians came to Arakan "as servants and labourers and as such they were wanted in Arakan" and when they settled as peasants "there was enough room for them because of the lack of Arakanese farmers. 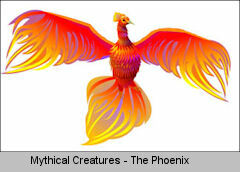 The first clash between them was with the advent of the Japanese in 1942. But that is a story apart." Extract: Paragraph 7 - "The Moslems in that portion of Arakan which adjoins the border with East Pakistan number about 400,000 and have lived there for generations and have acquired Burmese nationality. But they are patently of Pakistani origin and occasionally some Pakistanis cross into Arakan illegally and mingle with the local population. As part of a drive to detect these illegal immigrants the local Burmese authorities have for some time employed extremely oppressive measures. The Pakistan Government are anxious that these Arakanese Moslems should not be goaded into leaving Burma and taking refuge in East Pakistan which cannot support them. Mr. Bhutto therefore urged the Burmese to modify their attitude towards these people and offered the maximum cooperation in dealing with any genuine illegal immigrants." 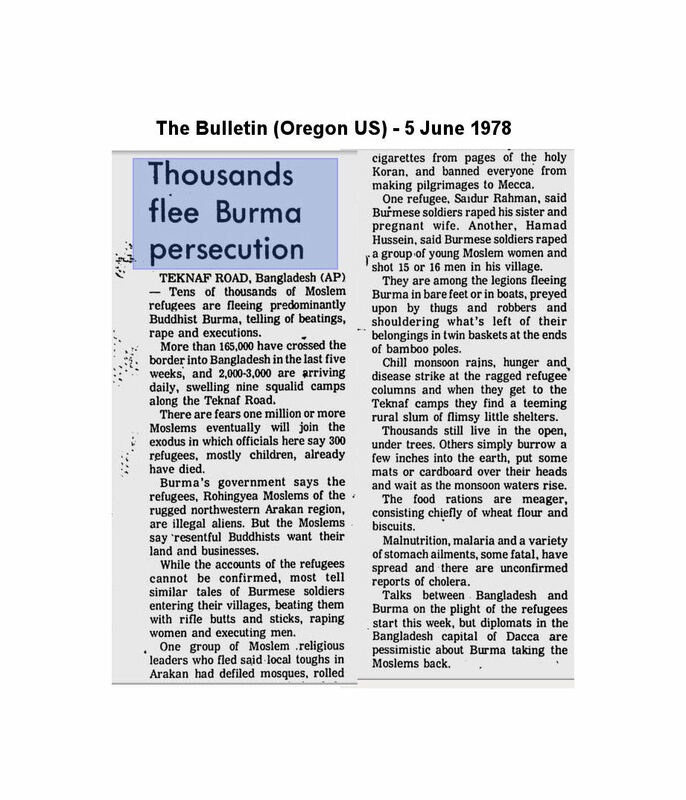 Extract: "Also discussed was the problem of the roughly 250,000 Moslems resident in the Province of Arakan whose nationality is unclarified because the Burmese regime regards them as illegal immigrants from East Pakistan. 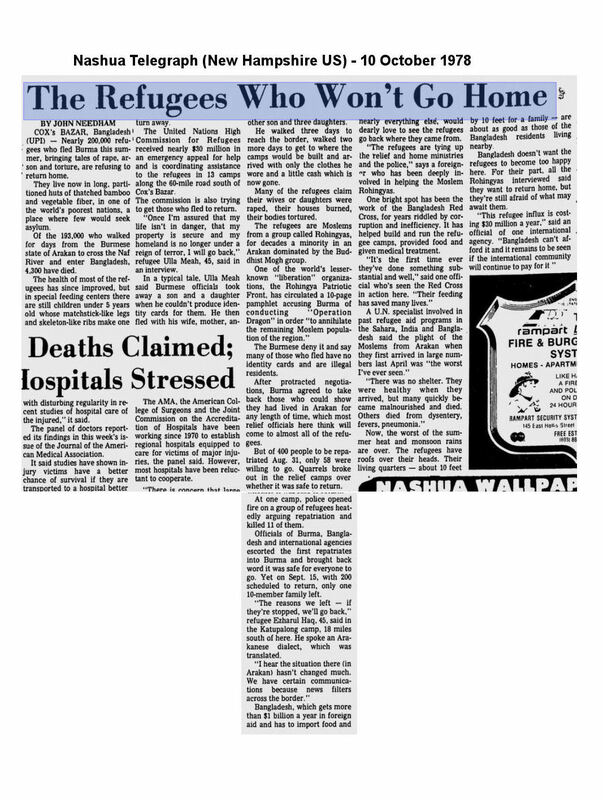 A majority of these Pakistani immigrants who are unable to prove that they have been resident in Burma for at least three generations are being and will be deported by the Burmese authorities to East Pakistan, but both sides are concerned not to play up these events, and only very occasionally do Pakistani press reports on this subject appear. The delimitation of the open border between both countries could shortly be resolved through an agreement". “AT DINNER ON JUNE 13, THE AMBASSADOR DISCUSSED BURMESE-BANGLADESHI ISSUES WITH THE BRITISH, AUSTRALIAN, WEST GERMAN AND MALAYSIAN AMBASSADORS. TO A MAN THE OTHER DIPLOMATS AGREED THAT ON THE BASIS OF THEIR INFORMATION THE BANGLADESH CHARGES APPEARED TO BE CONSIDERABLY EXAGGERATED AND INCONSISTENT. 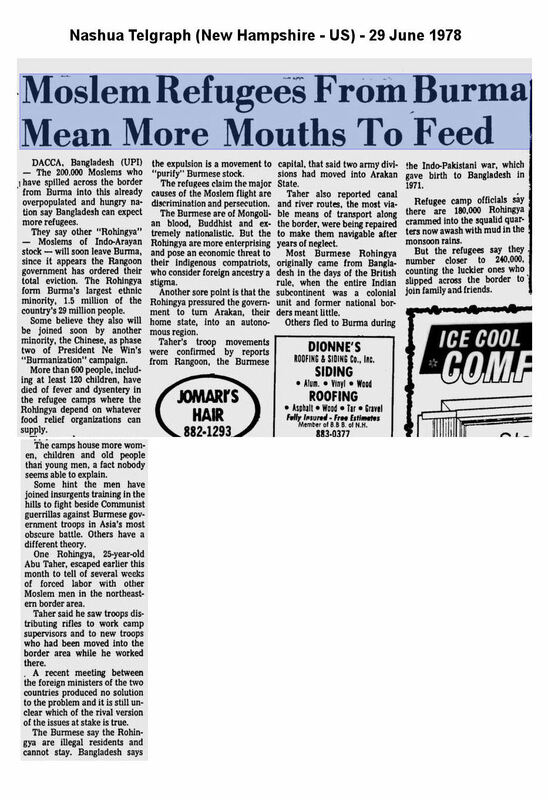 THEY ALSO NOTED THAT JOURNALISTS OTHER THAN THE ONE AMERICAN EMBOFFS MET WITH (RANGOON 2132) SAW NORMALLY FUNCTIONING MUSLIM VILLAGES IN THE ARAKAN WHICH WERE NOT BEING HARASSED BY GUB AUTHORITIES......WE REMAIN SKEPTICAL THAT THE GUB HAS EMBARKED ON A SYSTEMATIC CAMPAIGN TO DRIVE MUSLIMS OF CHITTAGONIAN ANCESTRY FROM THE ARAKAN, OR THAT THE REFUGEE-ALLEGED ATROCITIES HAVE OCCURRED.” (14 June 1978). 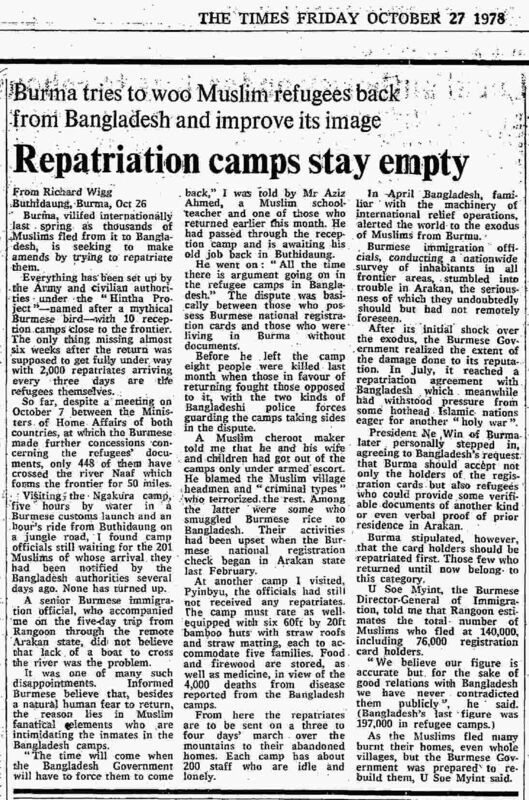 Derek Tonkin writes: These 1978 officially released reports are consistent with UK diplomatic reports already released to UK National Archives. 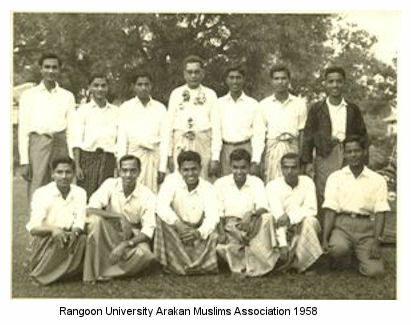 It is worthy of note that at the time (1978) the US authorities referred to the Muslim population of Arakan as “Arakan Muslims” or “Chittagonians”. The word “Rohingya” is to be found only in the names of Bangladesh-based organisations. By 2002 however the word “Rohingya” was being used in US cables from Rangoon. 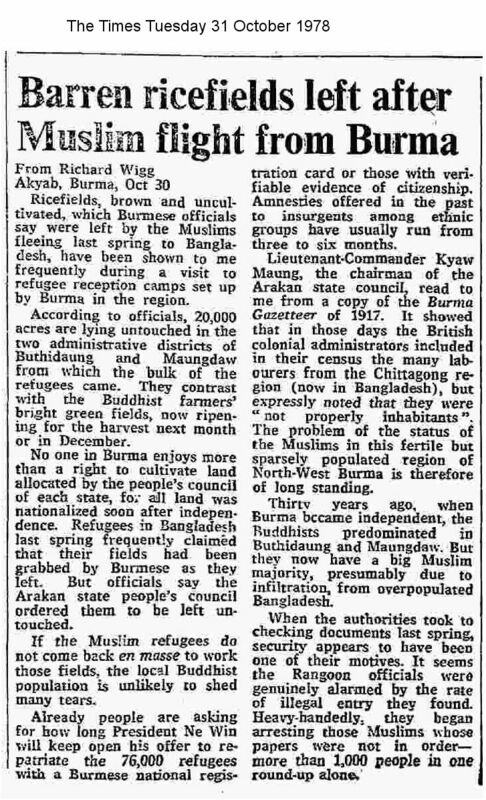 The attached article from AsiaWeek, a subsidiary of Time Inc., dated 14 July 1978 highlights the problem which has arisen because "the proportion of 'Chittagong Muslims' has been steadily rising; these are people who moved into Burma from the Chittagong area of Bangladesh. They have settled down as farmers and fishermen, but many are active in the smuggling trade. They apparently have access to relief goods supplied to Bangladesh, such as clothing and medicine. They also bring bicycle accessories, Horlicks, Ovaltine, biscuits and talcum powder through the well-trodden jungle paths into Maungdaw. In the village of Phone Nye Leik, all the people I saw were Chittagong Muslims. Burma looks upon these people as illegal immigrants...."
"Rohinja is one of the minorities of the Union and Rohinjas must be loyal"
"In a 45 minute long speech VCGS impressed on the Rohinjas that they were Union citizens and there was no racial or religious discrimination in the country and that everyone in the Union are brothers and sisters of one big family. "He stressed the need for every Union citizen to be loyal to the Union and to cooperate with the authorities to establish the rule of law and restore peace and security in the country....."
The full text of Brigadier Aung Gyi's speech on 4 July 1961 in Burmese may be found at this link. Derek Tonkin writes: The articles are unequivocal in two respects. Firstly, that according to the VCGS those who call themselves Rohinja/Rohingya are Union citizens and one of the ethnic minorities of the Union, but secondly that they are of Chittagonian origin living on both sides of the border, in what was then still East Pakistan, as well as in Arakan. Researchers may wish to know that the Foreign and Commonwealth Office has now released files for 1982 relating to Burma/Myanmar. These include File FCO 15/3177 “Burmese Citizenship Law 1982” which includes diplomatic reporting on the significance of the Act, from both British and Australian sources. Derek Tonkin writes: These reports merit close reading because they support the conclusion today that it is not so much the letter of the Act as the subsequent bureaucratic obstruction which has led to the very serious difficulties over citizenship which Arakan Muslims in Rakhine State face today. See also Problems with facts about Rohingya statelessness - Nick Cheesman December 2015 in this context. the identity of the indigenous Arakan Muslims was also the subject of a hard hitting article by Seit Twe Maung, quite possibly a pseudonym, entitled “Rohengya affairs" in the publication “Rakhine Tanzaung Magazine” Vol. 2 No. 9 1960-61. While expressing his sympathy for “those Arakan Muslims who have stayed among us for generations. We will continue to regard them as our kinsmen and our brethren”, he criticises Muslim writer Ba Tha for a recent publication about the history of “Roewengyas” and concludes: “It is quite clear why Ba Tha and his comrades are trying to create these Chittagonian settlers as an indigenous separate race.” Ba Tha’s article asserted that the descendants of early Arab settlers were called Rowenhynas who later became Roewanyas. Seit Twe Maung clearly doesn’t believe a word of all this and tells us why in considerable detail.